Unlike Eastern Australia where most unconventional gas deposits are found in coal seams, in the Kimberley and other parts of WA the majority of unconventional gas is found in shale beds and tight sandstone rock strata. Shale and tight gasfields involve the industrialisation of entire landscapes with numerous closely spaced wells. Typical gasfields contain thousands of wells. Gasfields also require vast networks of access roads, gas pipelines, processing plants, compressor stations, and wastewater holding dams and treatment plants. 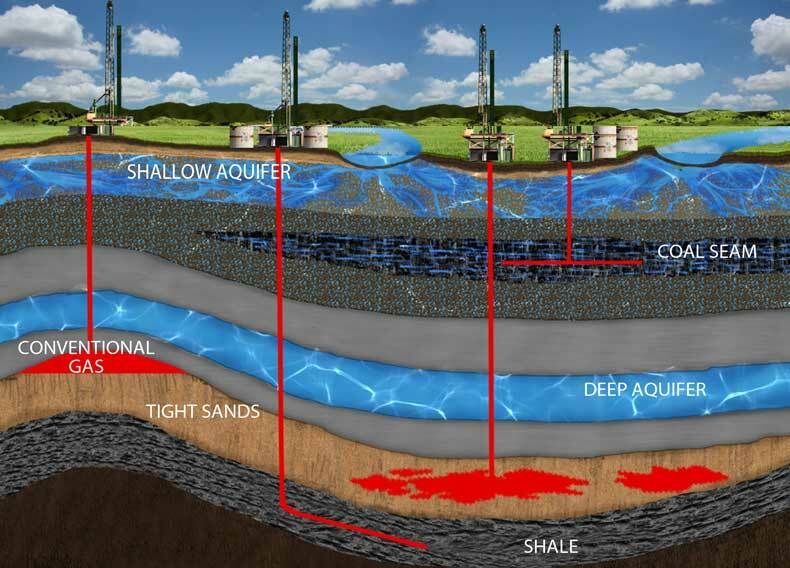 Techniques such as horizontal drilling and hydraulic fracturing (fracking) are needed to extract commercial quantities of shale and tight gas. Fracking involves pumping large volumes of water, chemicals and sand (or other ‘proppants’) into the ground to increase gas flow. Tight gas also requires acidation, which involves pumping acids into the well to dissolve the cements between rock grains. Fracking is an extremely water-intensive practice: A single shale gas frack uses 11-34 million litres of water. That’s roughly 360 – 1100 truckloads. Wells are often fracked on multiple occasions, sometimes up to ten times, multiplying overall water use. The large amount of water used in fracking would put additional pressure on the Kimberley's seasonally limited water resources, which are relied upon by communities and pastoral and agricultural industries across the region. Chemical use in fracking: A wide range of chemicals are used in fracking. Whilst the industry maintains that ‘most’ of these chemicals are found in household products, fracking compounds used in Australia have been shown to include many hazardous substances, including carcinogens, neurotoxins, irritants/sensitisers, reproductive toxins and endocrine disruptors. Many of the chemicals used in fracking have never been assessed for their long-term impacts on the environment and human health. Issues with fracking wastewater disposal: Large volumes of toxic waste water are produced in fracking operations with 15-80% of this waste returning to the surface and being stored in holding dams. This wastewater contains drilling and fracking chemicals and other substances present in the source rocks. These contaminants include heavy metals, radioactive materials, volatile organic compounds (VOC’s) and high concentrations of salts. Fracking waste water is usually disposed of through reinjection into aquifer formations, held in holding ponds for storage/evaporation, or partially ‘treated’ and reused or released into waterways. Leaking ponds, monsoonal floods or accidents during transportation can lead to contamination of local waterways and aquifers, threatening wildlife, agriculture and human health. The Kimberley's annual wet season makes fracking operations and managing wastewater ponds even more risky here than in other parts of Australia. 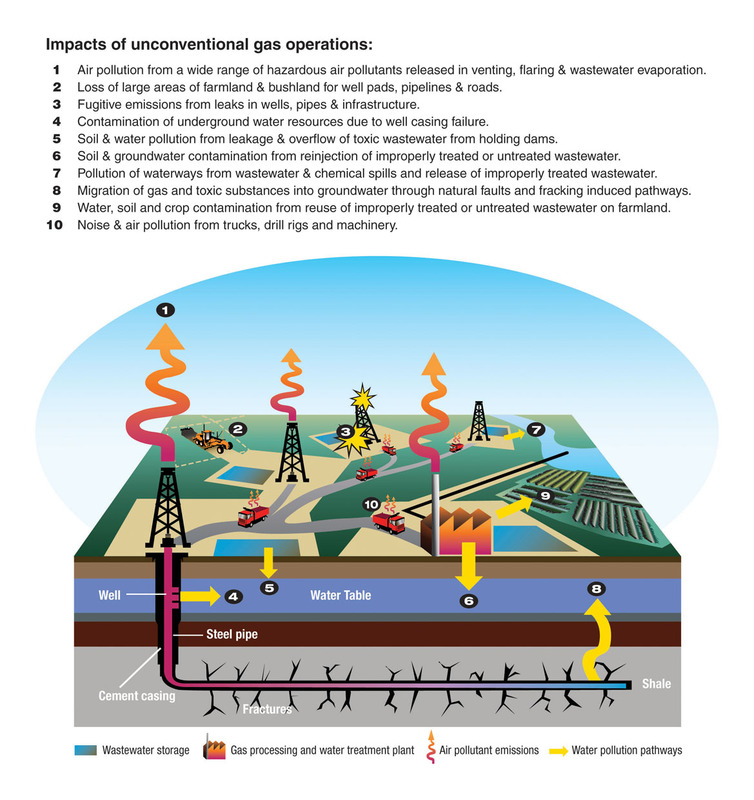 Serious health consequences: Fracking operations pollute the air with a range of toxic gases and Volatile Organic Compounds (VOC's). There is a growing body of research from overseas that highlights the impacts of dangerous air pollutants on human health in communities living in close proximity to fracking and unconventional gas operations. Communities living near gasfields in the US have reported serious health effects following the commencement of unconventional gas operations, including respiratory ailments, nose, throat and eye irritations, and neurological illnesses. APPEA: The Natural Gas Revolution- Natural gas from shale and tight rocks. National Toxics Network: Toxic Chemicals in the Exploration and Production of Gas from Unconventional Sources.